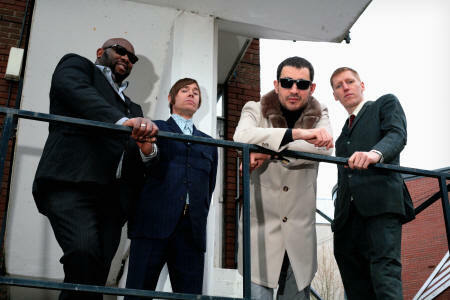 Big Boss Man formed in November 1998 and their sound is a hip heavy Hammond hybrid of pop, 6T's R'n'B / latin soul and funk. A stunning live proposition Big Boss Man have played hundreds of concerts and festivals across the UK, Europe and Russia. Recent outings have seen them touring France with Lisa and the Lips and Nicole Willis and performing at the cult music festival Cosmic Trip and the prestigious Isle of Wight Festival. Big Boss Man’s music may sound familiar to you, being regularly played on television shows and BBC Radio, by DJs including Mark Lamarr and Craig Charles. The band recently appeared live on UK on Cerys Mathew's BBC6 Sunday Morning show. Their track 'Party 7' was featured in the international NIKE WORLD FOOTBALL '06 CAMPAIGN advert featuring Thierry Henry and Eric Cantona. The entire soundtrack to The Mighty Boosh’s BAFTA nominated short film “Sweet” was provided from tracks taken from the Big Boss Man’s “Humanize” album. The band have performed live on national Spanish television and had tracks included on XFM London Radio and “Later” magazine compilation albums. Big Boss Man official remix of the modfather Paul Weller's single "The Bottle" went straight in to the UK top 20 and fast became a collector’s item. Their new album Last Man on Earth, released to glowing reviews is available now.